NASA’s Lunar Atmosphere and Dust Environment Explorer (LADEE) spacecraft will continue its successful mission with an announced extension of 28 days in orbit. This follows a first-ever high-bandwidth laser communication which took place from the Moon to the Earth. It also included continued atmospheric analyses, and a tricky snapshot by the Lunar Reconnaissance Orbiter (LRO), another spacecraft working to further the scientific understanding of our nearest celestial neighbor. This extension translates into the eventual end of the spacecraft’s mission to be pushed back to around April 21, allowing for more time for the satellite to study the Moon’s atmosphere. LADEE arrived at the Moon on Oct. 6, 2013, one month after being launched from NASA’s Wallops Flight Facility on Sept. 6, 2013. When LADEE’s mission comes to an end, it will purposely fall to the Moon’s surface. Along the way it will continue to collect data from dust samples and send the information back to Earth, and its impact will hopefully be observed by LRO thanks to a recent encounter helping to increase these odds. LADEE’s retrograde orbit runs from east-to-west along the Moon’s equator, while a south-to-north orbit is being performed by LRO. The two spacecraft came within 5.6 miles (9 km) of each other on Jan. 15, as both satellites flew by around 3,600 mph. An image that required precise timing of LADEE in flight was taken by LRO thanks to some ingenuity and a bit of luck. With LADEE’s flight path not passing directly underneath LRO, mission commanders had to compensate by having the LRO roll 34 degrees to allow its Narrow Angle Camera (NAC) a 1.35 millisecond window to get a clear shot of LADEE. 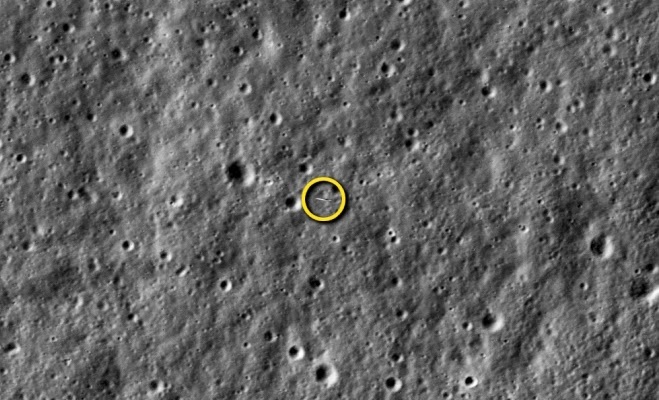 The image taken by the LROC was slightly distorted, but still provide a one-of-a-kind image that may impact the chances of LRO to get a snapshot of the results of LADEE coming to its final resting place. Designed and built by NASA’s Ames Research Center in collaboration with NASA’s Goddard Space Flight Center, LADEE is being used to study the density and composition of the Moon’s faint atmosphere, also known as a surface boundary exosphere. This type of atmosphere turns out to be the most common in our solar system with others existing on Mercury, large asteroids, and other moons orbiting the outer planets. Despite the commonality little is known about them and researching by LADEE at the Moon is believed to help future mission and the understanding of similar solar bodies. 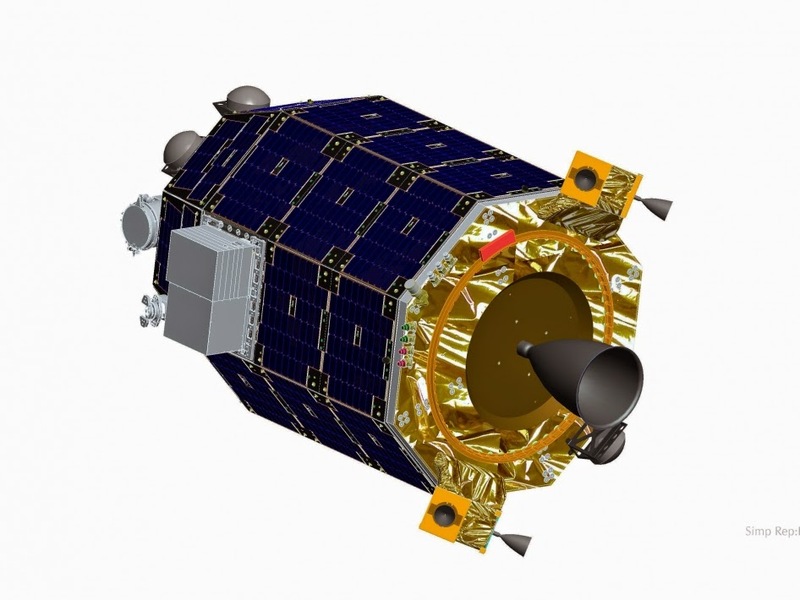 Science teams working for LADEE are also analyzing atmospheric data collected from the Chang’e 3 landing on Dec. 14, 2013, that also coincided with the Geminid Meteor shower. Analyzing how molecules attach to airborne surface grains during impact events like this may provide more opportunity to decipher the so-called “hopping” of molecules on the lunar surface. “The LADEE science team continues to analyze the data from the Chang’e 3 landing, episodic meteoroid showers and repeating variations as the moon goes through its phases. More surprises likely await us,” said, LADEE project scientist Rick Elphic , in a statement released by NASA.